You know, there really are no songs about Thursday are there? And there should be because it's a very good day of the week. It's an easy-street sort of day. Extra coffee break sort of day. Watch a few extra you-tube videos of Tina Marie sort of day. The quality of the light is different, and especially lovely in the late afternoon. And then there's Thursday nights, with it's potential for $6.50 movies at the Cobble Hill cinema, or pizza and a bottle of wine. And then maybe there will be flowers the next day; Friday... delivered right to your cubicle. A lovely coda inserted after your lunch break. Co-workers green with envy. You won't be able to concentrate for the rest of the day, not with that anemone staring at you. Good thing it's almost the weekend. Comment to win the drawing and good luck. 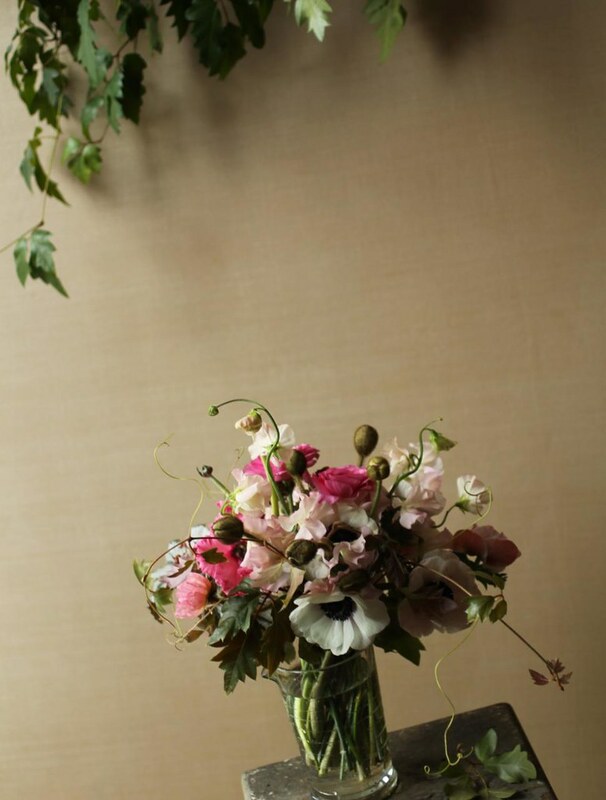 What a beautiful and delicate arrangement. Looks like the sunrise over the East River and the snow this morning. I need to give my S.O. the name of your shop for our anniversary. Oh, yes. I want to be struck mute by that arrangement. your arrangements are so pretty! This would be a great way to end the week after trudging through the snow to get to the office!! would brighten up my snow filled days! 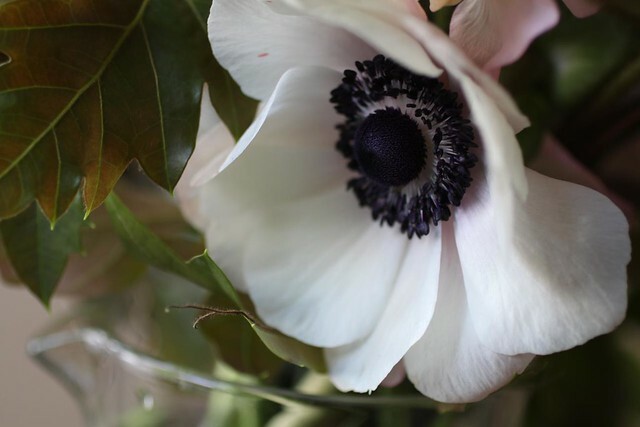 i love anemones, this is beautiful! Thursdays are great because they means it's almost Friday!!! 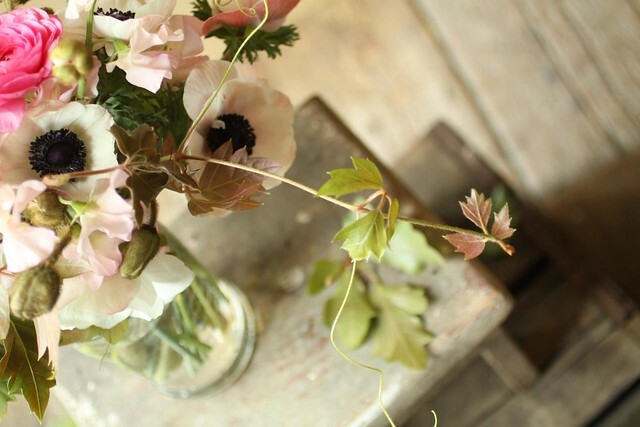 Anemones have become my new favorite thanks to your blog. That arrangement is a real beauty! Here's to hoping that this is the week! i haven't entered yet, sarah, but today seems like a good day. need me some anemone lovin this weekend. My friend could use a little cheering up! So gorgeous. I'll keep my fingers crossed. No, I'd definitely be spending all day wondering how best to baby that anemone on the way home! Nothing like flowers to brighten a snowy, wintery day in New York! Thursdays are made better with the chance to win Friday Flowers! I start school tomorrow with organic chem and a biology lab on plants... but I'd rather sit and stare at these beautiful anemones and call it studying. i'd love to lock eyes with that anemone! i just gasped when i saw the photos--stunning! Cypress Hills LDC has had a tough week, and would love some flowers to brighten up our somewhat messy offices. these are just beautiful and i think i have the same ikea pitcher vase :o) this would totally make up for not having a snow day! Lovely! But, how can you forget Thursday's Child by Bowie? Am I the only one that loved the video? delicious looking. not for erie basin. for me. Put a bird on it! :)Actually, the bouquet is beautiful just as it is. 1. Dismiss it out of hand, i.e., it "doesn't even start"
2. Power through, "never looking back"
3. Nothing to do but "watch the walls"
4. Tell it like it is, as in "I don't care about you"
I'm going to try number 3.
those flowers are gorgeous ! A perfect antidote to the endless snow! this has nothing to do with thurs or free flower fridays, but i HATED forsythia until i saw you force that one next to your jade green glass. from now on could we just bring ALL the forsythia INSIDE?!!!! thanks. i would love that. one of these weeks I know I'm going to win. I just know it. What a stunning arrangement, I wish I lived closer so I could join in, I'm guessing delivering to the UK is pushing it?!?! Pretty please.... Oh well I will just have to keep teasing myself with the beautiful pictures. this is wonderful - please pick me! i am supposed to be in florida right now, to plan my upcoming wedding, but these 19" of snow are keeping me here in ny and back at my desk at work. flowers would help turn my frown over. I'm in Rhode Island so can't get any flowers but wish I could be at that Cobble Hill theater with a box, I mean bottle of wine. Thanks for sharing! These would definitely brighten up Friday clinic. Don't think my colleagues will be green with envy-more like yellow with happiness at the sight of these flowers. 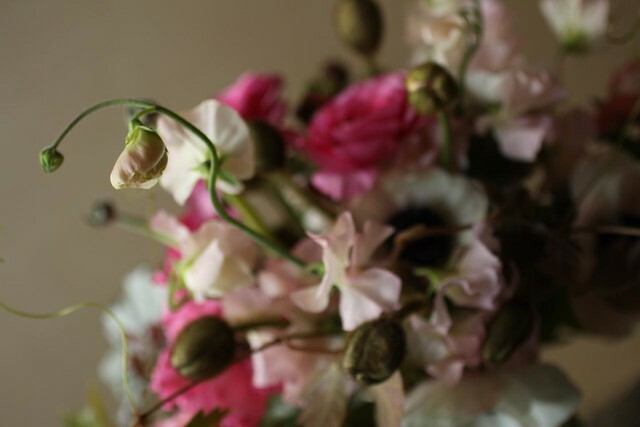 OMG- anemones, ranunculus & sweet pea blossoms?!! Three of my favorite beauties.